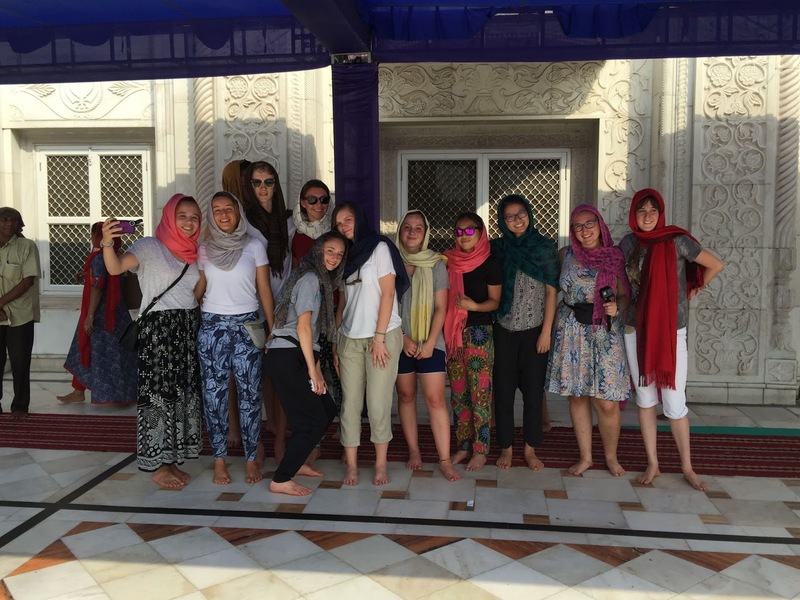 Namaste from India! Although we arrived at Joybells 2 days ago, our internet connections have been very sparse. I hope you enjoy the following blog post about our adventures in New Delhi written by Chianna Cohen on our way here. More to come soon! 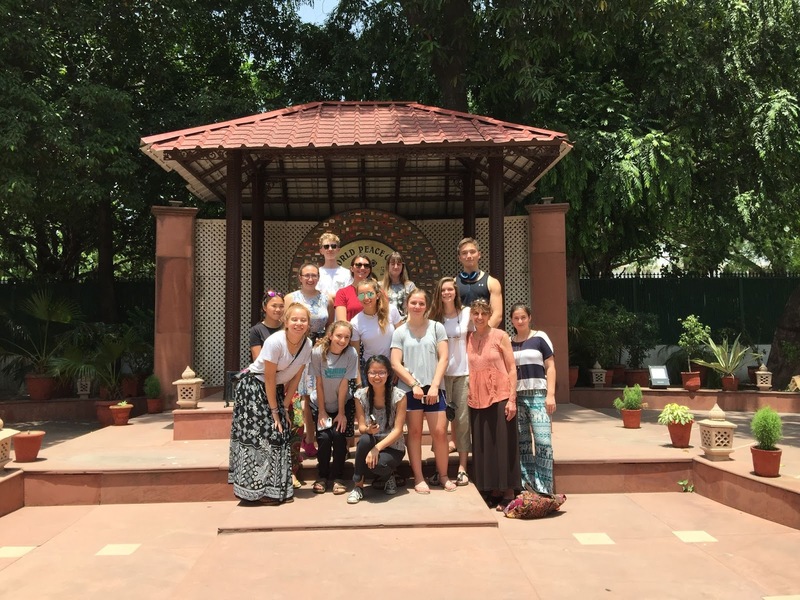 Yesterday was our first full day in India. 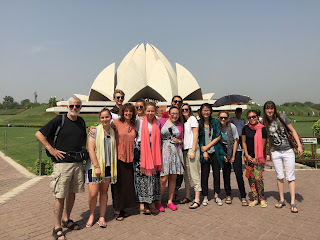 After a delicious India and American breakfast, we went to the Baha’i temple. It was a beautiful lotus shaped building with nine entry ways. Surrounding it were pools of water that many of us were tempted to jump into because it was so hot. This was also the first place we noticed how excited the Indians were to see foreigners. They asked for pictures with us and excitedly asked if we were from America. Many of us, just as eagerly, nodded yes and posed for pictures with the Indians. The Baha’i religion is a new religion created as a way to unite all religions in its belief that all gods are really the same. There are only a few temples around the world, including one in Chicago. The nine entries are the one feature that appears in all of the temples and they represent the entrance of all religions. Many of us, including myself, were amazed by the concept of this religion as it is not only accepting but unifying. My personal favorite part of the temple was listening to the singing or chanting inside. The shape of the temple created a beautiful sound, making it feel as if we were surrounded by the singing as it echoed around us. I could have stayed there for the whole day if not for the heat. After visiting the Baha’i temple, we made our way to the craft museum. 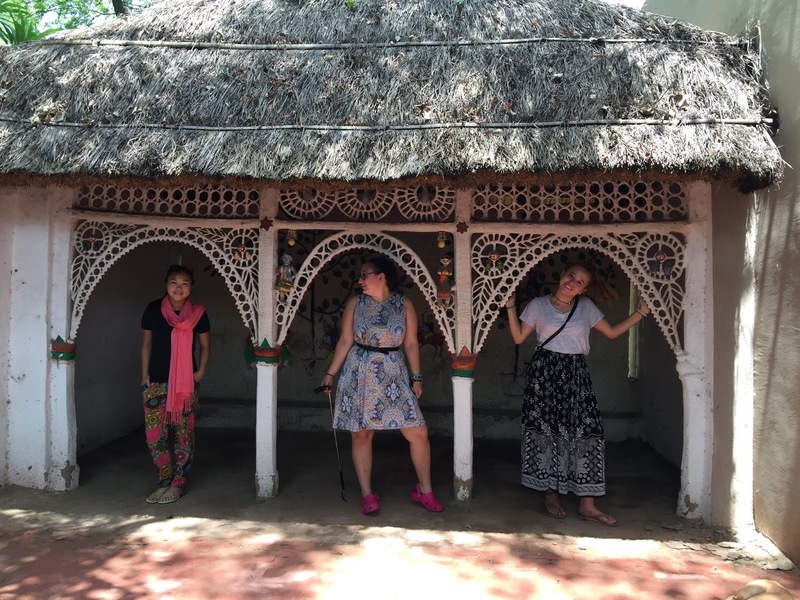 We got to see the painted huts from many different parts of India, traditional Indian crafts, and some people making the crafts. The paintings on the huts were especially impressive. Most of the women who painted them were not formally trained artists, but rather the tradition was passed down from generation to generation. A couple of us saw some traditional dancing at the craft museum. They danced and drummed in a circle, stomping out their own rhythm. Two of the men were dancing on stilts, hopping up and down and clapping to the rhythm and somehow still keeping their balance. Following the craft museum, we went to the place where Gandhi was assassinated. We walked the path Gandhi walked before he died before removing our shoes to get a better look at his memorial, which had the date of his death and his last words inscribed upon it. After, we went into his house, which told the story of Gandhi’s life. Before the trip, we had watched some clips of the movie Gandhi, so it was fascinating to see the actual location of the events depicted in the movie. Inside the house there was this fun lamp, which only turned on if people held hands in a circle around it, using our bodies as a circuit. I found this house to be a particularly interesting visit. Previously, when in South Africa, I visited the Satyagraha House, which is where he lived while there. Seeing the place where he died feels like seeing the bookends of his life. I've seen the place he lived when he started his activism, and now I’ve seen the place he lived at the end of his life, each location telling his story from a different perspective. By this time, we were all very hungry and went to eat lunch. At the restaurant, they served us spicy tomato soup, chicken, naan, and various delicious toppings we ate with rice. While at the restaurant we also celebrated Audrey’s birthday. 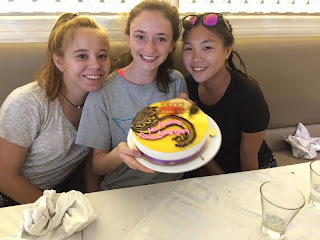 Her cake was beautifully decorated with a design that looked like a henna tattoo and was served with ice cream. 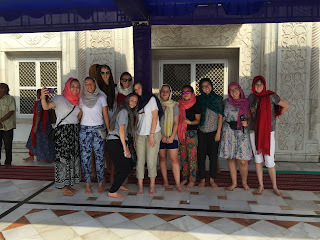 After lunch, we visited a Sikh temple. 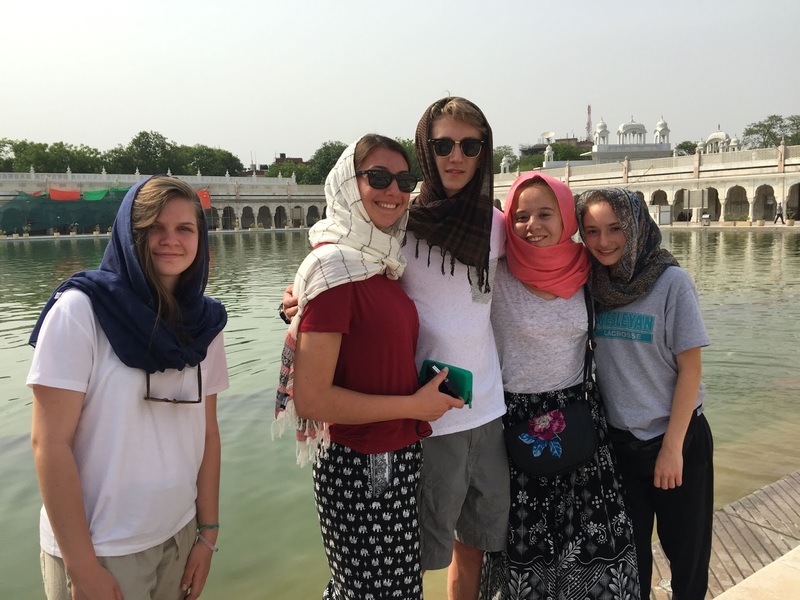 We all had to wear scarves to cover our heads before entering the temple. We also had to remove our shoes. We walked through the temple, the inside of which was beautifully gold plated, many people sitting and praying. We then went outside and waded into water that supposedly had medicinal properties. I watched many people go into the water, fill up their water bottles, sip it, or splash it on their heads and their heads and their children’s heads. Then we received some blessed food, holding out our cupped hands to receive it. It was slightly warm and tasted like a mix between porridge and cookie dough, but more oily. I would love to know more about its meaning and felt slightly disrespectful taking it without completely understanding it. Then we went downstairs to the kitchens. The temple, with only the help of volunteers, feeds an impressive number of 25,000 people of each day and 50,000 on Sundays. While going to the kitchen, we walked past the room where people were eating. There were rows upon rows of people of all ages sitting on the ground back to back creating a sea of colors. We then entered the kitchen. The women were rolling out dough for bread and the men were stirring vats that were twice their size. The creating a production line to make it a more efficient process but it is pretty amazing to think that they make most of the food by hand. At the end, we wanted to read more about the temple, but there weren’t any English pamphlets left, so we all struggled to read them in other languages we knew or studied in school. Many of us were unsuccessful, except for Minh, who translated some of the Russian for us. Finally, we went to Dilli Haat, the market. We learned to bargain for our stuff, and some of us, not including myself, found we had a talent for it. Many of us bought clothes appropriate for the weather and gifts for relatives and friends. It was a fun experience getting to talk to the people, and Leela became friends with one of the sellers. After we returned to our hotel early, we ate dinner, met as a group, and, if you were lucky, fell asleep. This morning we left at 4:30 to get to the train station. We said goodbye to Delhi, and I am currently typing this on the way to meet the kids at Joybells!